Once again it’s Competition time! 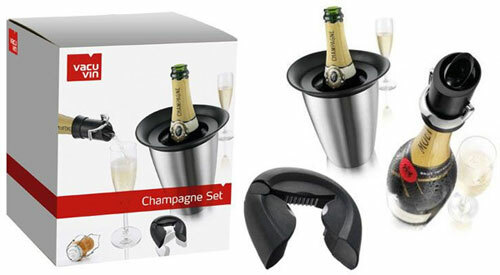 Do you want to WIN our 3 piece VacuVin Champagne Accessories Gift Set worth £34.95? If so, simply enter our Summer Competiton…you could be the lucky recipient come the end of June, it really is that simple! This 3 piece gift set includes a VacuVin Champagne Opener, a VacuVin Champagne Saver and a VacuVin Rapid Ice Champange Cooler! This gift packaged set is the ideal champagne set, all you need to add is some bubbles to the occasion! How do I enter the Wineware Summer Competition? It’s simple! To be in with the chance of winning our fantastic Summer prize…simply like us on Facebook, follow us on Twitter, Tweet us, or leave a comment on the blog! The Wineware Summer Competition ends midnight on 30/06/2015…so enter now to be in with a chance! As much as possible – Wouldn’t like to put a number on it. Quite a few birthdays coming up this summer so it would get lots of use. My wife’s birthday, our anniversary, our retirement, England win the Ashes, England win the rugby World Cup………perhaps even on my birthday? So I make that six times…..if nothing else exciting happens. As often As possible as it’s great. Daily! I have a glass of wine every evening throughout the year, and more during the Summer, when we have bbqs, picnics etc! Would love to win this for a great summer picnic. Very regularly!! We have lots to celebrate later on this year (hopefully) so the corks will be popping! I would use this when i was having dinner parties. This would be brilliant! new baby due in 9 weeks and I would love to celebrate! With my 60th birthday in the summer, and a new grandchild due at about the same time, there’s going to be a lot of champagne consumed in our house so it would get a lot of use! We’d use it a few times a year – Christmas, Easter, special occasions and birthdays. At least once, gotta have some champers once the new babys born! Well I ordered a new garden set today so every weekend if i have my way! As much as I could! Every week or so as we have many family celebrations coming up and we are very partial to a bottle of fizz just because sometimes we can ! I would use it probably weekly, along with Saturday BBQs! Every weekend, drinking champagne in the garden. I would use it at every celebration this summer. Champagne always means fun and laughter. Would suit the Champaign lifestyle I aspire to! I’d have a Wimbledon champagne party! summer tea parties in the garden! always! faye. Every week, at the weekend. it would get used quite a bit this summer. our family have a few birthdays, two first wedding anniversary’s and a 60th wedding anniversary. We drink 1 or 2 bottles of sparkling wine most weeks through the summer and this would be used almost every weekend! This fantastic set would be perfect for my 25th Wedding Anniversary in July then I would use it again and again at every family celebration there is. Oh no would that mean I had to drink more champagne? Well if I must, would hate to disappoint! Well my birthday, anniversary, to celebrate a new job so three for champagne, but I may use it for prosecco also. I’d use this as often as possible on my balcony, in the summer! Of course I’d use in the winter too, especially around Christmas time! Fab chances to win prizes thanks!!!!! every bbq & party across the summer I would use the opener & the cooler – not so sure about the saver though! At the moment I would probably use this beautiful set every week as I’ve just made some elderflower champagne which is ready to drink! Once a month, what a nice treat it would be. I’d probably use it every other weekend, I reckon – fizz in the sunshine can’t be beaten! We would use the set pretty frequently , quite often over the weekends we enjoy champagne or sparkling wines ( especially new finds ) . As often as possible. Probably every few weeks. As often as funds allowed.